While Nikon’s COOLSHOT Rangefinders are great for displaying distances to the pin, they are just as useful for finding distances to unwanted objects (hazards, trees, etc.) on the golf course as well. Knowing these distances will remove the stress of the unknown and allow you to focus on learning to manage your game better. 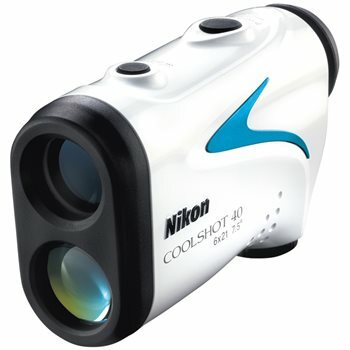 The Nikon COOLSHOT 40 Golf Laser Rangefinder is the most powerful USGA-approved rangefinder of Nikon’s line. HYPER READ technology has been included with the COOLSHOT 40, which provides a quick and stable measurement response regardless of distance to the target. With the combination of HYPER READ and a wide field view, keeping the ball on the short grass and acing the hole will be much easier. The COOLSHOT 40 can withstand rain, cold and heat with its durable rainproof design and wide temperature tolerance. It can also withstand low light situations with lenses that have multilayer coating, which ensures an extremely bright and clear view. Excellent product.....perfect size, easy to use, precise, detailed, reputable company.....why pay more?